Well, the El Niño weather has brought so much rain that this week's photos are technical charts and graphs based on an astro image captured last week. Sorry about that, but performing astro photometry and doing technical analysis ties observation together with astrophysical theory. This makes a good combination and It's fun too, so stay tuned in. the binary companion of Polaris. The reported magnitudes of these two binary stars are 2.0 for the bright one and the dimmer one is 9.2, which is not naked eye visible. But my first calculated estimate of the dimmer magnitude was only 7.0, so what is going on? First of all remember that the magnitude, used in astronomy, is logarithmic so the light intensity difference between the two stars is really 759 to 1. That is for each photon received from the dim companion, 759 photons will be received from the bright companion. 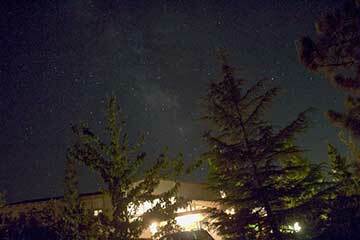 This difference is why the brighter one is naked eye visible and the dim one is not. The first step in resolving this measured discrepancy is to review the Polaris image using other tools available in the AIP4WIN software. The star image tool in this software was used to estimate the magnitudes of the stars, but here the use of the line profile tool is used to resolve the puzzle. The first image shows in the top section two panels where the line profile of the dim companion is shown. The panel to the right shows the light intensity along the line drawn in the left hand panel. Note how the selected line shown on the left that the intensity of light from that star has the profile on the right. The intensity profile rises to a peak and then returns to zero. Now in the bottom set of panels the line profile through the bright companion is shown. Note here how the intensity profile is seen to rise to a peak value and then stay in saturation for many pixels before returning back to zero. This profile curve indicates that the image exposure of 0.6 seconds was too long and magnitude estimation based on this image with too much light coming in from the star is not going to be accurate. So this time another learning lesson offered up this surprise. An exposure that is set long enough so that the the dim companion can be easily seen in the photograph turns out to be too long for the same image to be used to do science. Yes, doing astronomical science is more than pretty pictures. It is also about using those images to measure physical characteristics of the objects. So, what to do now to rectify the situation? Well, I sought some advice from DSLR expert, John, and OCA secretary and author, Bob. They recommended a couple of things to do. One idea was to check the camera linearity and saturation level. Another was to consider using another star with magnitude intermediate between 2 and 9.2 as the comparison star. This approach would increase the signal to noise ratio. Thanks a lot guys! Characterizing the camera used to take the images makes sense in that any physicist wannabe should understand the limitations and capabilities of the instrument, in this case the camera, used to capture the data and make the measurement. 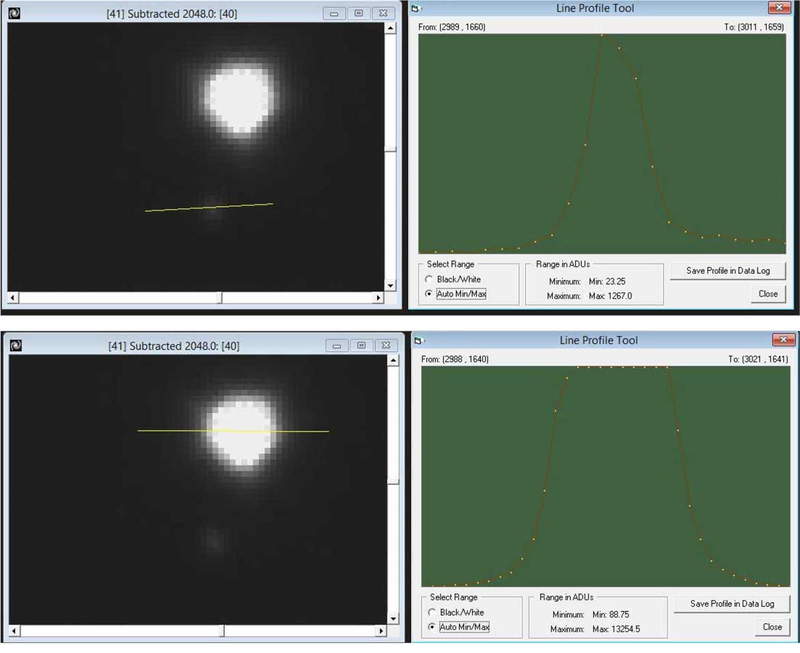 The second attached image shows the dats plots identifying the linearity and saturation level of my camera. The charts plot the camera pixel measured value vs. the shutter exposure time. The camera was focused on a white door under low illumination during this test. A random pixel was chosen and used for all of the exposure settings. Note that for ISO = 100 camera setting the camera response is mostly linear for all exposures up to 60 seconds. 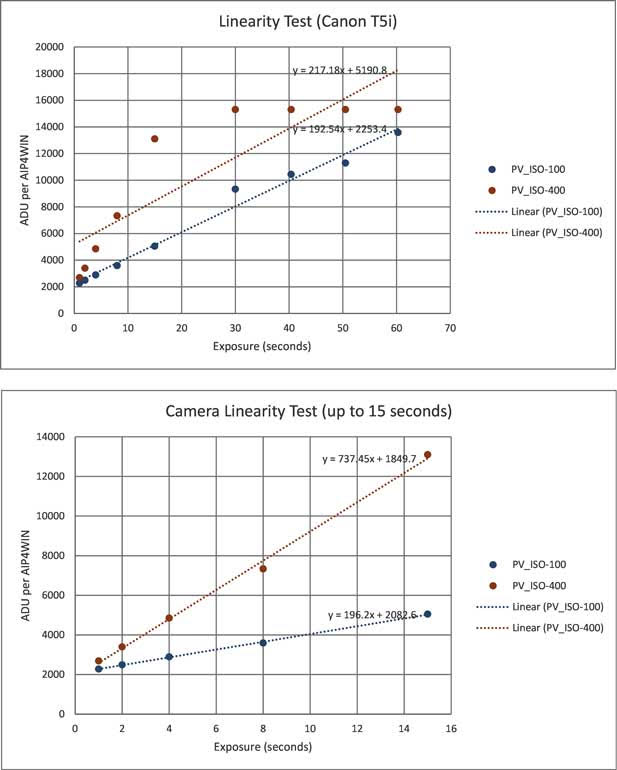 When the camera speed is increased to ISO=400 the camera response increases, as it should, but that the camera pixel values starts to saturate at ADU value of about 15,000. This makes sense for 14-bit A/D with zero offset at 2048, which fits the assumed camera characteristics. Now, knowing the linearity and saturation characteristics of the camera, it is possible to pick the right exposure setting so that the image of the bright Polaris companion does not saturate the camera and yet still be able to barely capture the dim companion too. Then, when the camera image of Polaris is not saturated, a more valid estimate and validation of the dim companion can be made. So, with this new lesson learned, I'm ready to do more astro photometry. The practice with Polaris is just for fun. Future observations of unfamiliar stars will be of more scientific value. During my next scheduled observing time I will follow up with an image of Polaris, but this time with shorter exposure and then do the analysis to see if the measured magnitude of the dim companion matches up with published value. The best exposure setting will be short enough so that none of the pixels covering the bright companion are saturated and the pixels covering the dim companion are still sufficiently illuminated to be detected. The best shutter setting is estimated to be 1/20 second, rather than the 0.6 seconds used previously. So the image will receive only 1/12 illumination of that of the photo from last week. Well, I'm just waiting to make that confirmation observation and that's it for this week. I'm feeling a little bit like some of the professional astronomers must also feel when they have to wait for scheduled time on the big scopes to make their desired observations. At least I don't have to write a proposal and wait months to get time on my scope. I just have to wait on the weather.